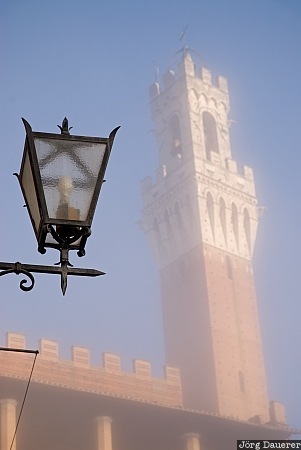 A street lamp and the silhouette of the tower Torre del Mangia partially obscured by morning fog in downtown Siena. Siena is in the central part of Tuscany, Italy. I took this photo in the morning when thick morning fog was wafting through Siena. For a brief moment the sun was breaking through he mist and Torre del Mangia became visible. This photo was taken in the morning of a sunny day in October of 2009. This photo was the image of the month in July of 2010. This photo was taken with a digital camera.